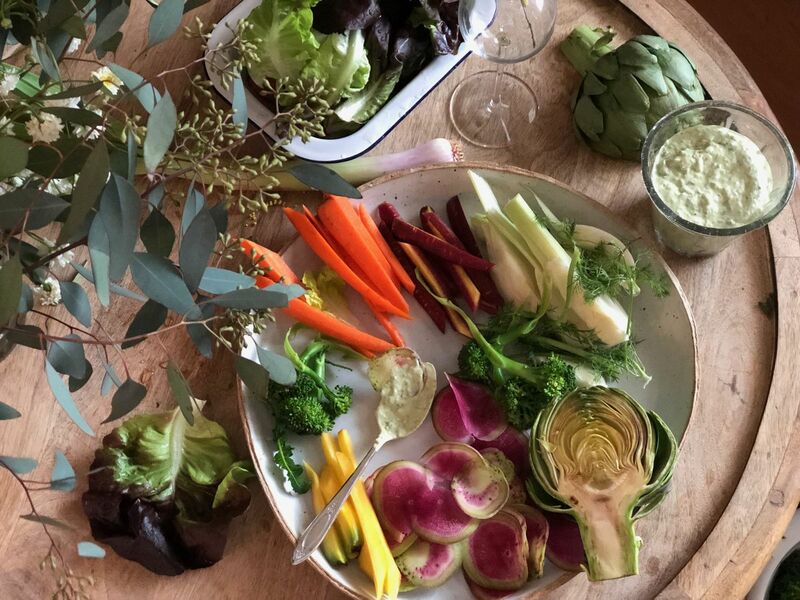 This is a play on the California classic Green Goddess dressing and is ideal for crudités, sturdy leaves like kale and chicories such as endive and escarole. Unlike its cousin, the classic vinaigrette, it doesn’t play well with soft, tender greens. In lieu of mayo or sour cream, plain yogurt and avocado add creaminess; if you prefer your dip a little thinner, add some good extra virgin olive oil or a little buttermilk. Any leftovers brighten up grilled fish or steak, and add a fresh green bite to chicken salad or salmon cakes. This is also delicious for dipping hot french fries or potato chips. 1. Trim and prep vegetables. If serving asparagus, broccoli or green beans: bring a large pot of lightly salted water to boil; add trimmed veg and blanch for 2 to 3 minutes. Transfer to a bowl of ice water to stop the cooking process. Drain and pat dry with kitchen towels. If serving artichoke, trim the stem and remove the outer layers. Using kitchen shears, trim the sharp tips of the leaves. Steam whole until tender when pierced with a knife point. Cut in half and remove choke. For other vegetables, such as carrot, endive, radish, fennel, etc., trim and cut and keep in a bowl of ice cold water until ready to serve. 2. Make the dip by combining all the dip ingredients in the bowl of a food processor. Taste and add more garlic, lemon juice, salt or pepper, as desired. Chill until ready to serve. Note: Dip can be made up to two days ahead and stored in an airtight container in the refrigerator.